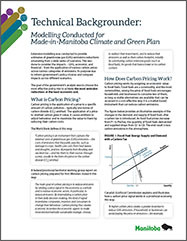 Extensive modelling was conducted to provide estimates of greenhouse gas (GHG) emissions reductions emanating from a wide series of scenarios. This was done to consider the impacts - GHG, economic, and financial - from the application of various carbon prices across various categories of emissions. Its purpose was to inform government's policy choices and compare impacts across different scenarios. The goal of the government's analysis was to choose the most effective policy mix to achieve the most emission reductions at the least economic cost.